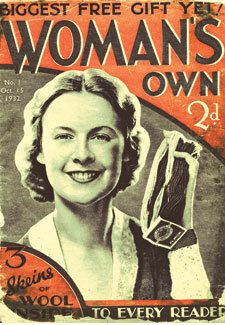 See our first issue of Woman's Own from 1932! See our first issue of Woman’s Own from 1932! As we celebrate our 80th birthday this week we wanted to give you the opportunity to see our first ever issue it in all its glory! The free gift on October 15 1932 was 3 skeins of wool, which you’ll see our model is proudly holding in the cover photo, left.